The Moore Street site was ruled a “battlefield site” by the High Court in March. 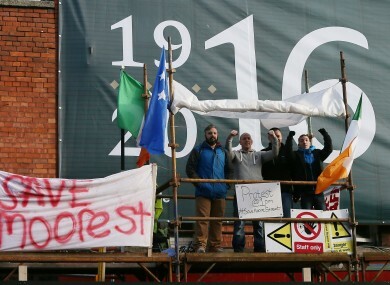 Protesters who occupied Moore Street in February of this year. THE GOVERNMENT HAS decided to appeal the recent High Court ruling which declared Moore Street a 1916 battlefield site to the Supreme Court. Earlier this year, a court action was successfully taken by the 1916 Relatives Group which sought to prevent the destruction of buildings on the street. In March, the High Court ruled that Moore Street was a “battlefield site” and therefore was due protection. In a 400-page judgment, Justice Max Barrett said the “wealth of evidence before the court” pointed to historical significance in some of the other buildings. These include number 10, a portion of the parting wall at number 13 and number 18, as well as the building at 20-21 Moore Street. Last year, the government stepped in to buy the site at 14-17 Moore Street, the building where the Rising’s leaders met and decided to surrender. Minister for Arts, Heritage and the Gaeltacht Heather Humphreys argued that other buildings on the street, such as 13 and 18 and 19, “are not historically significant”. However, the High Court ruled against that decision. Today, Minister Humphreys said due to the potential widespread implications of the judgment for planning and development nationally, the government would be appealing the decision. She briefed Cabinet on the issue today, stating that she intends to establish a consultative group on Moore Street, as a means to make positive progress in relation to the future of the street. The decision to appeal the judgment was taken following advice from the Attorney General and consultation with a number of government departments and agencies, including the Office of Public Works (OPW), the Department of Transport, the Department of Environment and Transport Infrastructure Ireland. There are various reasons cited for the appeal, but the pivotal concern is that the judgement would have wider implications, which extend beyond Moore Street. She said she believed the judgment could be used as a means to obstruct or delay planning and development right across the country. The judgment extends the scope of national monument status, setting a precedent which could affect a wide range of vital infrastructure projects. I fully understand that Moore Street is a location that holds great importance for many people. However, this judgment has implications that extend far beyond Moore Street. The legal advice I have received, coupled with input from other government departments, highlights the impact this judgment could have on infrastructure projects countrywide. Humphreys said the decision to appeal the High Court ruling does not mean a way forward cannot be found. Following a suggestion from Fianna Fáil, a consultative group on Moore Street with an independent chair will be established in the coming weeks. The group will include cross-party Oireachtas members and other relevant stakeholders. It is understood the families of the 1916 leaders will fight the appeal. Sinn Féin leader Gerry Adams TD has condemned the decision by the government to appeal the High Court decision which protects the 1916 Moore Street battlefield site. Adams said he is “horrified”. It is scandalous that in the centenary year of the Rising that the government would refuse to uphold a court judgement that would protect Moore Street and its environs that are part of the legacy of 1916. Instead of defending and protecting the historical legacy of the Rising the government is putting the rights of developers and profiteers first. Email “Government to appeal decision to protect Moore Street battlefield site to Supreme Court”. Feedback on “Government to appeal decision to protect Moore Street battlefield site to Supreme Court”.